I held a Kimber super carry ultra today and thought that because it is .45 it would make a good additon to my collection. But, then I thought, if the R45s was for sale, I would buy it in a heartbeat. So, the Kimber did not come home with me. I need the R45s to be out soon..........or I may buy something that I will regret. I have only recently came into the wonderful world of Rohrbaugh's, however I have found myself thinking the same thing since I read about the R45's! I'm eager with anticipation. I have a feeling if and when they do come out you will be needing that password. Better hang on to it! Growing old is mandatory, growing up is optional!! There you go again, John -- dangling before a certified "grip junkie" those Esmeralda Celtic cross beauties. Now, once again, I need to remind myself of Tracker's advice regarding the balance between "need" and "want." Very nice, indeed, John! And congrats TpaBay. I hope forum members get first crack at getting on the list to recieve one of these R-45's we have been very (semi) patient waiting on it. Art thanks but my Kimber is Gone. 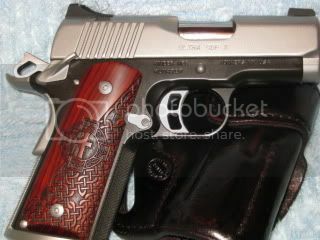 The grips went to a forum member and the gun went to a local buyer. It was a very nice shooting & looking gun but I wanted something with a Bobtail so thats what Im working on now. Since thor447 broke the silence on the 380 topic line, I thought I would awaken the R45 one which has not been particularly hopping since the earth shaking unveiling in January.